What makes a hill or a mountain? For most people it is just a spot higher, or much higher, than the surrounding land. A more precise definition, however, uses the concept of prominence, a simple measure of how far you need to descend from the summit before land rises again towards a higher point. In the US, peaks with 300′ or more of prominence are ranked peaks and you can find lists of them by county, state, or country. Each new peak climbed is a discovery, a new vista, and experience. Yet not all interesting peaks fall in that category. Annie’s Rock, high above Lake Berryessa has no prominence, so is not actually a peak at all; it’s just a lookout on the side of a higher, quite nondescript mountain. I’d known about the spot, preserved by the Tuleyome conservation group, but not visited it before. This week with clear autumn weather I decided to check the Stebbins Cold Canyon UC Davis Natural Preserve, which had newly reopened after being burned in the Wragg Fire last year. 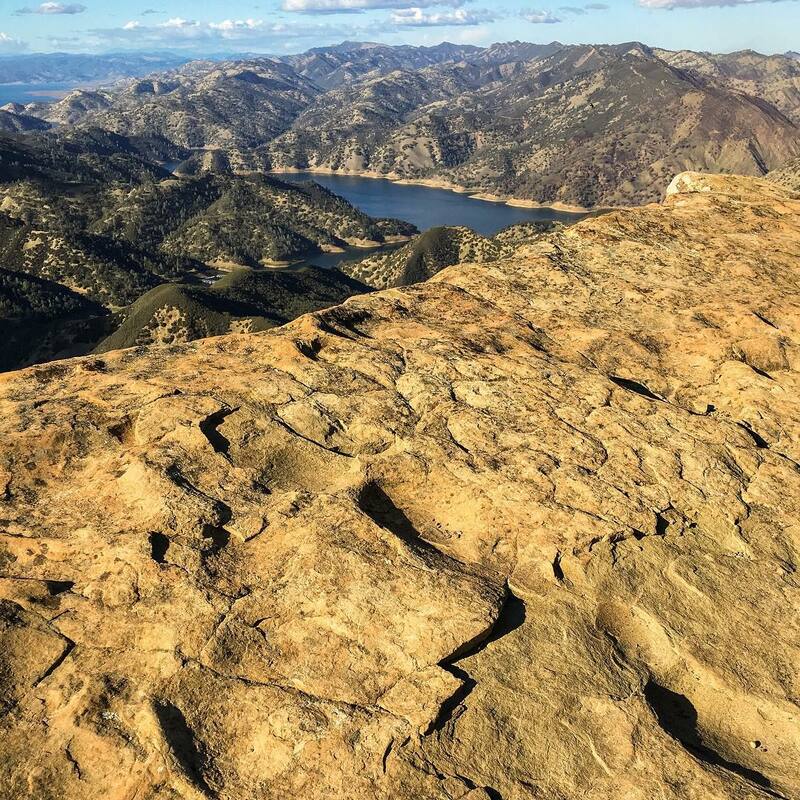 There’s a ridge trail that zigzags up a steep hillside to a sharp ridge with marvelous views out over the newly declared Berryessa Snow Mountain National Monument. Higher up the trail winds through bay and madrone forests before finally emerging at Annie’s Rock, a large slab jutting precariously out of the hillside, perched high over the open landscape below. Alone on the rock I savored the view, and rested. The obvious photo was just the rough textured rock slab and the mountains and lake in the distance.